The clothing at Från Ö till A consists of a refreshing mix. 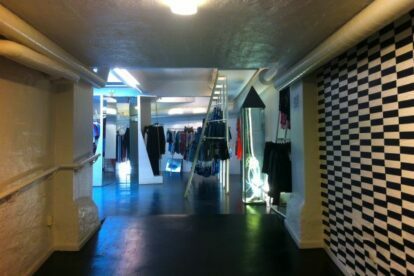 Here you’ll find both pop-up brands, Swedish designers, as well as the owner’s own brand of jeans. It’s very modern, and it appeals to all genders. Coming here is not only about the clothes though: with its three floors, 500 square meters and small cave-like rooms the whole environment becomes something extra and worth a visit in itself. It sort of feels like you’re at an exhibition, since pieces hang scattered along the rooms and therefore acts more or less like work of art. And as if someone heard my prayers – the thrift store Humana just moved into the cellar of the store! So now a visit is even more justified. Boutique events and shopping nights are taking place down there now and then as well, so do keep an eye on their Facebook page for updates.